I commonly get asked how to save more money. It makes sense, I run a frugality themed website so the question comes with the territory. In many instances I’ll answer the question and the person is genuinely thankful and didn’t realize they could do “X” or “Y” to save more money. I provide them a few tips of where to start and am relatively confident I was able to help. It’s the others that make me wonder. They think there is some trick, some secret sauce to saving money – to the point they think it’s impossible for them to save money. As I think back over my years, I’m inclined not to judge them because I know there was a time I thought the same. So, what did I do? I continued to spend money that I had no business spending. The result? I racked up more debt and I moved further away from the wealth creation needed to give birth to financial independence. It doesn’t have to be that way. You can save more money. You can grow wealth. You can move towards financial independence. One of the main keys (ok, I know this is oversimplifying it a bit) is to stop spending money you shouldn’t be spending. It’s that simple. This doesn’t mean you need to find your “latte factor” (a term I hate) and simply cut back on it. It means to stop spending money you shouldn’t be. Whether it be on foolish stuff that provides little to no measurable return in value or lowering costs on things you do need it means one thing – stop spending money you have no business spending. Master that and you will be well on your way to saving more money in 2016 and in the future. 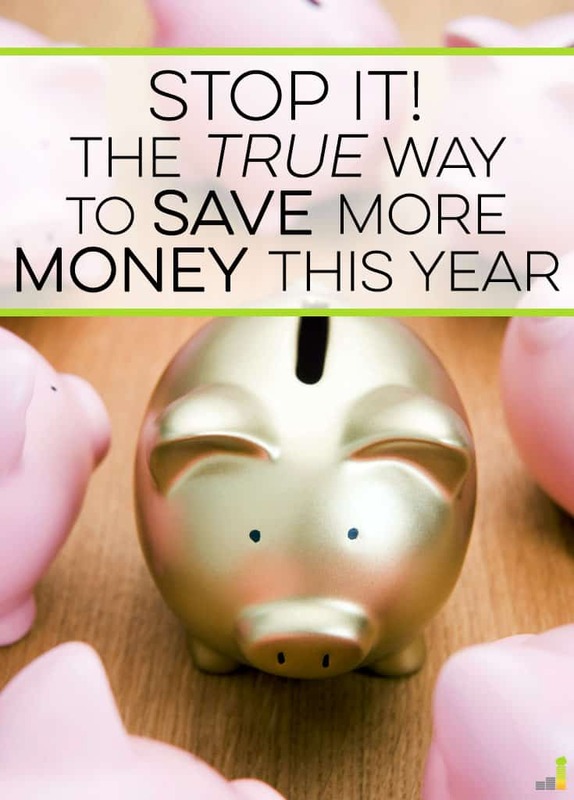 If you want actionable ways to save more money this year, check out this post, this post, this post or this post. Today, we’re short and sweet. 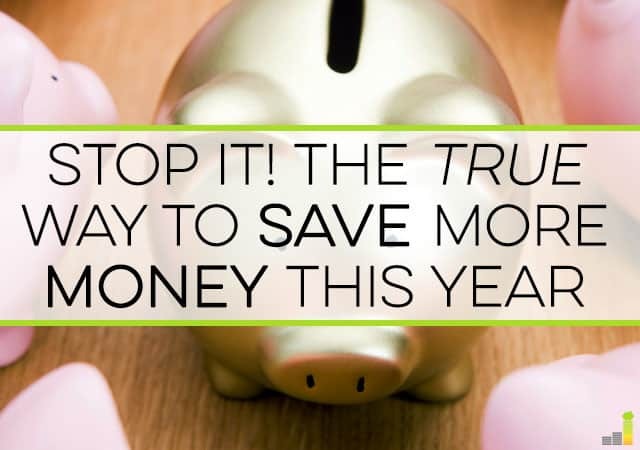 If you want to save more money in 2016, it starts with one simple thing – stopping spending money you have no business spending. What is one you plan on saving more money in 2016? What’s one area you struggle to save money in? What do you tell those who say it’s impossible to save money? If people just listened to this post they would change their lives. Well said!! Loved the video and as simple as it sounds most of really just need to stop it. So much truth to this simple statement. Sometimes things aren’t as complicated as we make them. It definitely is simple – almost too simple. So very simple, but so true. I always like to think about this in terms of the people of the Great Depression. They didn’t have credit cards back then, so if they didn’t have the cash, they didn’t spend the money. So simple. It is that simple. But, sometimes we need to hear it over and over again. “Stop spending money you shouldn’t be spending.” Something to remind yourself daily. We do definitely need to hear it regularly, overspending can happen to the best of us. Your statement is simple at it’s base, but it assumes people can decipher what they “should” and “shouldn’t” be spending, which unfortunately simply isn’t true. If it was I think there would be a lot less debt in the US! Touche DC. Though, I’ve found that many times the person in question knows they shouldn’t be spending – they’d rather have the “conveniences” the spending provides or view lack of spending as being a miser which also isn’t true. ha ha! Seems to simple, yet so difficult to do. I think people have one area in their life where they really struggling with “stop it.” There has to be some deep psychology surrounding that! I think there is Tonya. None of us are perfect and thus prone to not stopping something in a given area. Learn to spend less than you earn from day one. It’s really easy to get off track with all the credit options available, but if I could go back in time, this is one rule I’d always follow. You and me both Kim. I recently read about a service that allows you to finance your domestic travel at a better rate than a credit card. All these people were saying how great it was. All I could think was – if you can’t afford to buy a round trip domestic airfare in full, you have no business spending that money. My plan for saving extra money is to simply assume I haven’t earned a portion of my income, which will then automatically go into savings as leftovers at the end of the month. Hilarious video, by the way! That’s a good way to view it. I did something like this with the raise I got last year. I just assumed it didn’t happen and increased the amount going to investments/savings by the amount of the raise. I’ve done that before in the past as well – very simple, yet a great way to save/grow your money. It’s really good simple advice! I’m going to save this year by seeking out less expensive insurance! This is very true. It is easy for people to spend spend spend without thinking of the consequences. Thank you for making it simple! It can definitely be easy to spend with little thought – we can all be guilty of it. Love this post!! So true 🙂 My “trick” to saving more is to make more. If I don’t make more, I save the same amount but spend less. If I have a good month, I usually do spend a bit more but I also save more – which is the best way to save more money haha! Ha! I am old with you John because I remember Newhart as well. 🙂 For me, my biggest money saving move in 2016 is just focusing on my goal. If any expenditure works toward my goal, then I will make it, if it takes me further back from my goal, then I will just say no.